No matter what stage of blogging you are in, the number one question is always about increasing page views. And why wouldn’t it? It’s the way bloggers make money. When bloggers grow quickly, people want to know how. But first we have to preface, most blogs, including ours, is a marathon race, not a sprint. This is a lot of work and the general time frame is 3-5 years (depending on several factors) before you see the results. The first year, most blogs fail…just like any other small business. 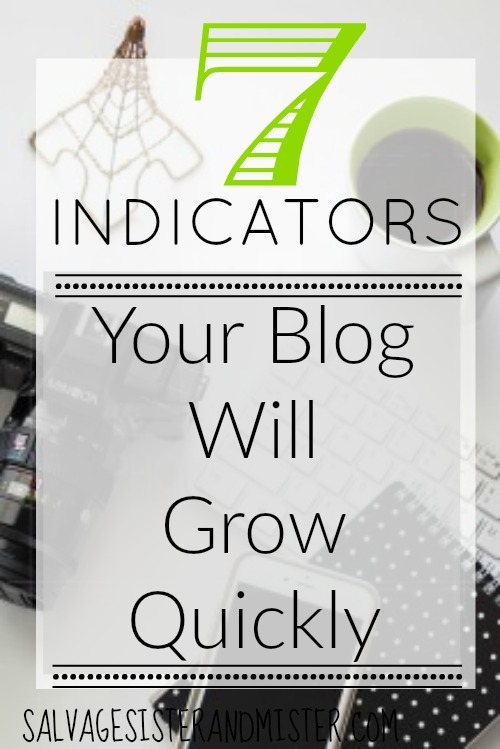 7 Indicators Your Blog Will Grow Quickly…or why it’s not growing. IMAGES – If you already own a DSLR, know how to use it, and have mad editing skills and software, you will have a leg up on your competition. Now, obviously we talked about how we use cell phone images HERE but that is because we can’t afford to make that investment, just yet, so we make the best with what we have. TIME – Do you homeschool 4 children, have 3 kids under 5, or work another job? If so, you just can’t compete with someone who does this full time. That’s not to say you can’t blog, BUT you can’t compare your growth to someone in a completely different space in life. If you blog full time, you will have more opportunity to do all that needs to be done…which is a LOT! IT FACTOR – Recently, we posted a meme on our Facebook page about a bride and groom who asked their grandma’s to be the flower girls at their wedding. They did something you always do, flower girls, in a whole new way. If you can come up with spins or new ways to think of things, this will help you tremendously if you are in the creative market (DIY, Home Décor, Cooking, Crafting, etc). But even if you aren’t in the creative field, you will need fresh new ideas in every topic. You want to write about raising children? There is a lot of info out there. What makes your article or project special? What gives it the “It Factor”? Side Note – If you do this without copying other people’s ideas, be prepared for people to steal yours. WEBSITE/TECH KNOWLEDGE – Until you can pay someone to do this, for the first year or two, you will do html, plugins, widgets, header, banners, design, create videos, etc. You will need to know regulations and legalities. If you have some of this knowledge already, or it comes easy to you, this will be incredibly helpful. If you don’t, or need more, this is one resource that will be extremely helpful What the Tech (affiliate link). And even if you can pay someone to do it, you will need quite a bit of knowledge to know if they are doing what you want them to. It’s difficult to oversee something you don’t understand. NETWORKING – Do you have a natural tendency to network with others? There are Facebook groups, social media, collaborations, sharing contacts, etc. You might be working at home, but you will need to connect with others to get your name out there and to help others do the same. DELEGATE – Yes, the first couple of years (or maybe less) you are a one person show. HOWEVER, the sooner you start delegating, the more you can focus on your sweet spot. Knowing what you do well, what you can delegate, and LETTING someone do it (control freaks you are gonna struggle) enables your business to grow. BUSINESS SKILLS – This is a business. If you have some management training, taken business classes, have a degree, or you just have a business mind, you will have important skills needed for the profession of blogging like bookkeeping, marketing, mission, brand, etc. Yep, our standard answer, you do what we do…make the most with what you got. Start learning as much as you can. In fact, learning is KEY and probably should have been our number one answer. ALSO, DON’T COMPARE YOUR JOURNEY TO SOMEONE ELSE’S! Another person might already have almost all of these attributes while you only have one. You are learning 6 new skills and they are hitting the ground running. You can learn from them BUT not compare! We believe as you increase in these areas, so will your page views. Are there other indicators to a successful site? We believe there are, but in looking at blogs that have grown pretty quick, we can see certain traits, and we believe these 7 indicators your blog will grow quickly are a common thread. Now you have your homework list. For us, we have been working on improving photography and tech stuff. How about you? Where are you going to start? And please let us know if you change anything and how it went. Quick Tip – The areas that you struggle with on this list, are the first areas to delegate. Know what you do well AND what you don’t.